Our single track system provides all of the tools required to solve the most complex design requirements. 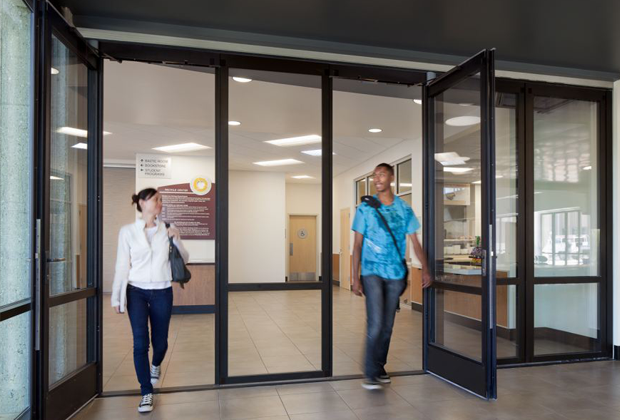 Unlimited door panels, commercially rated swing doors, and parking bay layouts customized to your surrounding conditions are just a few of the design features. With NanaWall intelligently guided door panels, the user can adapt space by moving panels from one opening to other opening(s). Watch our video to learn more about NanaWall Responsive Design. 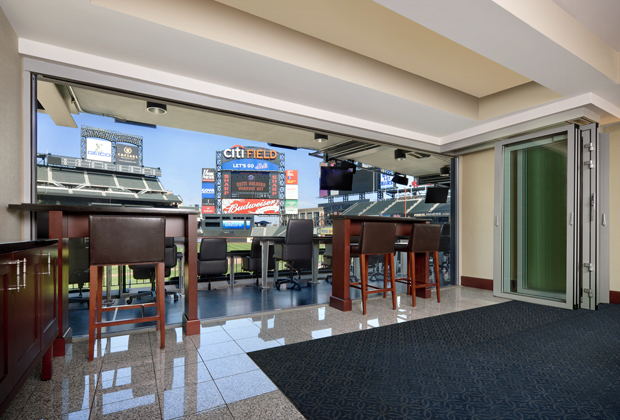 The NanaWall HSW60 offers commercially rated swing doors in multiple locations, wherever needed. Unlike other solutions, the swing doors can convert to sliding panels and are easily stored away. 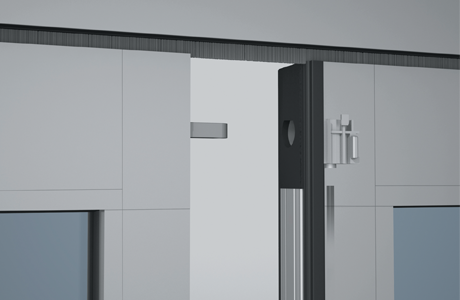 The swing door has been tested to 500,000 opening and closing cycles per the AAMA920 test standard and can accommodate self-closers, panic hardware, and a selection of push/pull handles. The NanaWall HSW60 can be designed using adjustable floor sockets instead of a floor track if desired. Choose from various sill options to fit your project needs. The NanaWall HSW60 can be designed as cornerless, multi-angled, t-section or segmented. The NanaWall HSW60 features an enhanced horizontal roller and guide track design that allows each individual panel to move effortlessly and intelligently around corners, posts, and anywhere else your design demands. The NanaWall HSW60 is engineered to perform in all climates. 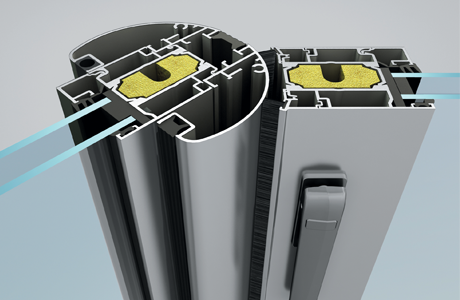 Completely tested for air, water, and structural performance, the NanaWall HSW60 can be used in almost any environment and has been tested and labeled to NFRC standards for thermal performance. 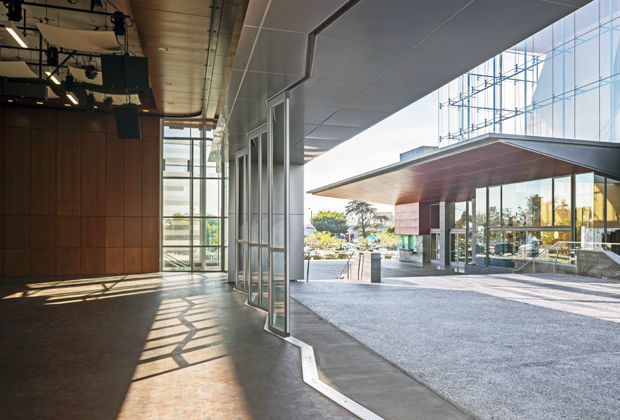 The NanaWall Single Track Sliding system can accommodate openings as high as 12 feet, only limited by the type of glass or other infill desired and the overall weight of an individual panel. In addition to exterior openings, the NanaWall HSW60 is designed to complement interior spaces both visually and functionally. Choose from a variety of glass options for privacy and sound control, and select from 50 standard powdercoat finishes to coordinate with your design. The head track can be recessed in the ceiling, while even eliminating the floor track for interiors. Adaptable, multi-function office interiors never looked and performed this good.